Is z/OS relevant in the Cloud? ASG’s Cloudfactory says yes! Cloud – one of the biggest buzzwords for the moment. It mostly deals with virtualization of workloads. As a mainframe architect, I am proud of the virtualization heritage of the z/OS and z/VM systems with over 50 years of solving customer problems. IBM is always the first to point out that the mainframe is the original Cloud platform. While I want that to be the acceptable answer, I was originally skeptical, but then, I think I’ve seen the answer. What does it mean to be “in the Cloud”? Recently, talking to one of my peers, who was telling me that “every problem” in Cloud could be solved on a mainframe, I decided to challenge him. I’ll start with the usability. I always fall back on three users: Consumers, Application Developers and Systems Programmers. I know on the mainframe, we have terms like Started Task that is analogous to Server instance or Daemon. I’ve written before how I believe the mainframe sales mantra has been to “boldly go sell where we’ve already sold before”. To me, Cloud is about new markets. 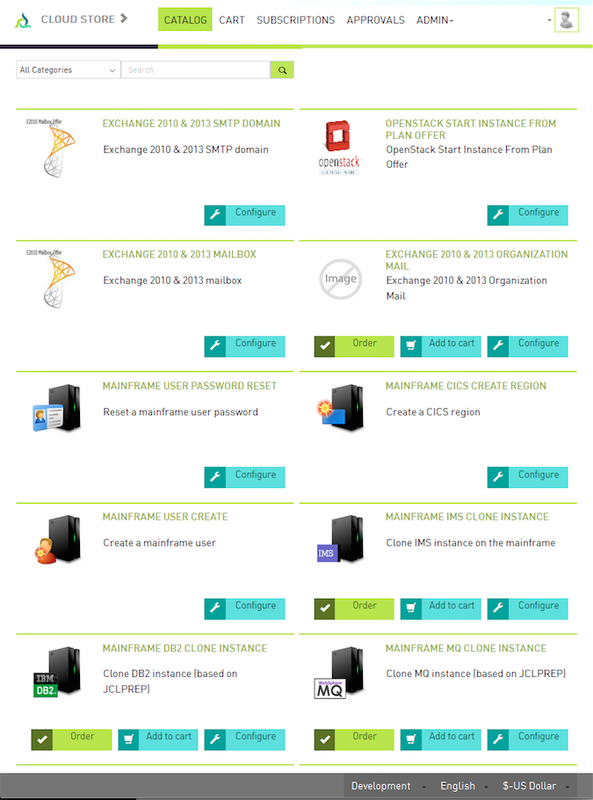 So the challenge is, how do you “start the cloud” on a mainframe. For z/OS, my friend told me it would be via JCL. What? How many “newbies” know JCL? That’s pretty limiting. Okay, that’s the Systems Programmer’s perspective. What’s the end user interface for this “cloud”? 3270 command line? As soon as I hear 3270, my radar goes off….a mainframe unique skill. Well, the reality of 3270 command line is that it is really no different than a Terminal session within Windows or Linux. However, the commands, unless network focused, have a different syntax and semantic than those other platforms. So that doesn’t necessarily help ease the learning curve. So my hunt for the ultimate mainframe Cloud deployment continues. I attended a demo of Allen System Group’s (ASG) Cloudfactory solution. It’s got an x86 version that allows a business to create a private cloud with a user interface that is simple and Amazon-like. What really struck me is that they’ve figured out how to use the same interface and apply that to z/OS. This appears to be the Holy Grail that I’ve been searching. I was not disappointed. First a look under the covers. 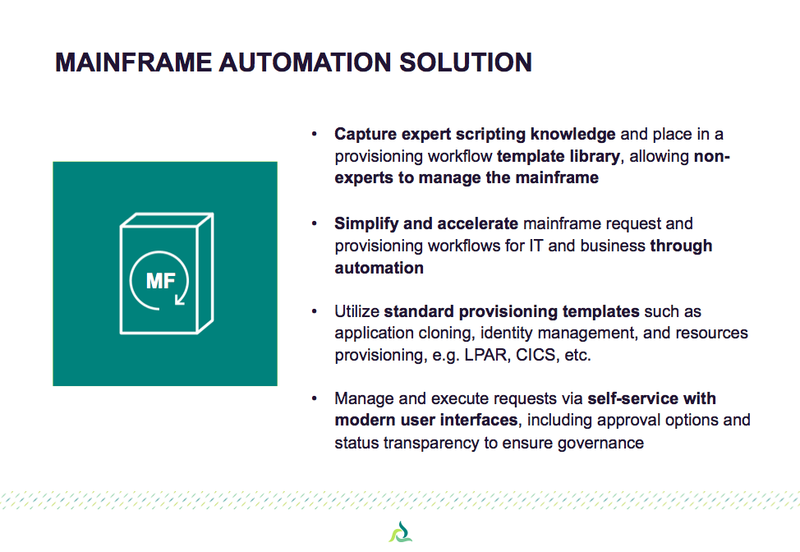 ASG uses the, relatively new, z/OS Management Facility (z/OS MF), introduced to enable web interfaces to traditional mainframe management facilities. The goals of z/OS MF include creation of a common interface, make it light weight browser-based, without need for “client” code on the end user’s device, leverage JAVA as the programming language and to get exploitation by all IBM system and middleware components, as well as offer the interface to vendors. z/OS does have a split personality disorder when it comes to a “common management interface”. IBM and every other vendor can and has presented their own “personality” for managing the mainframe. Here is a component that could help standardize that personality across vendor products. ASG is the first vendor that I was aware of to take advantage of the interface within their own products. The engineers showed me how mainframe IMS and CICS transactions can easily be changed toward deployment via a web-based interface. They showed me how they could start and stop transactions. They showed how to do some typical mainframe systems programming, using the cloud interface. In their words, they’d like to transition the level of knowledge and effort of “older” mainframe admins into something simple and familiar that any Generation Y, 25 years old, can operate easily. The workflow is fairly simple. A user enters the “Cloud store” to request a service. Information is filled in, specific to that task, via the web interface. A job is submitted via z/OS MF, the results are received and presented back to the user. A capability that intrigued me is they can associate a price with each type of transaction. That price is “customer” specific. Was it a competitive price? It is only competitive in the eyes of the business that deploys this because they are the ones that set the price. However, it did present a new “charge back” model for consumers of mainframe IT within a business. I hold out hope that IT groups can use this pricing model to offer a competitive hosting environment. Set up is required by systems programmers to enable middleware like IMS and CICS to enable deployment via Cloudfactory. That set up requires “traditional” mainframe management skills and up to two weeks to get an environment properly configured. However, that is time well spent. The effort is to leverage the experts to automate, document and provide templates for re-use that allow the next generation of admins to become effective and capable faster. In the process, less human errors will occur and result in better business continuity. In the presentation I received from ASG, it discusses an ASG Public Community Model that will enable a business to share templates with its peers. The goal is to help “lower the bar” on the effort required to learn, and speed time to deployment of simpler and automated management capabilities. This looks to be an intriguing capability, if effectively, utilized by the mainframe community. 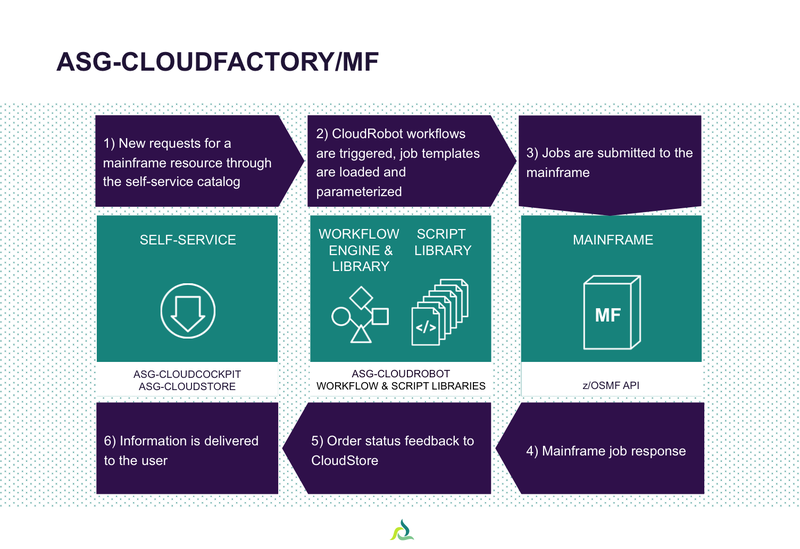 ASG Cloudfactory for Mainframe looks like it really can change the “face” of deploying workloads on z/OS and make it a true competitor for Cloud hosting workloads. If there is a downside, it’s that you can’t find many details or examples on the ASG website. That appears to be their unintended consequence of minimizing the details on their site. I received a presentation from them, from which I’ve included a few screen shots here on this blog post. You currently can’t find this level of detail on the ASG site. However, don’t be alarmed. I strongly encourage you to ask for your own demo. Feel free to contact ASG for more information by clicking here to request a demo. And truth in advertising, I have no business relationship with ASG, nor am I compensated by them. It was that impressive a demo that I thought it was worth sharing with this community. Cloud and mainframes can definitely be synonymous. ASG’s Cloudfactory could be an important element toward opening up existing businesses to new opportunities. Happy programming.